World Kidney Day is an annual global campaign to raise awareness of the importance of our kidneys, and to shine a light on prevention and early detection of kidney disease, which affects an estimated 1.7 million Australians – 90% of whom don’t know they have it. 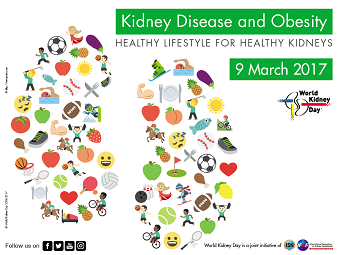 This year World Kidney Day promotes education about the harmful consequences of obesity and its association with kidney disease, advocating healthy lifestyle and health policy measures that make preventive behaviours an affordable option. Obesity is a potent risk factor for the development of kidney disease. Obesity increases the risk of developing major risk factors of Chronic Kidney Disease (CKD), like diabetes and hypertension, and it has a direct impact on the development of CKD and end stage renal disease (ESRD). The good news is that obesity, as well as CKD, is largely preventable. Chronic Kidney Disease (CKD) is a non-communicable disease that affects 1 in 10 people worldwide. While severity can vary, CKD is incurable and causes the patient to need lifelong care. As the incidence of kidney disease escalates, World Kidney Day plays a crucial role in educating the public, the medical community and governments and encouraging prevention and early detection of kidney disease. While the mortality associated with many chronic diseases including some cancers is stable and even declining, two Australians every hour continue to die with kidney related disease. Visit www.worldkidneyday.org for more information.